Every family wants to take holidays together, but for some parents the thought of putting their child on a flight is enough to make them dismiss the idea altogether. To discover more about this growing issue, Sunshine.co.uk recently conducted a poll of 1,762 British parents with children under five years old, to ask them how they felt about the idea of taking their child abroad. 1 in 4 parents were unwilling to take their child on a flight, mainly because they were too afraid of criticism from other passengers. Other parental fears included trying to keep the kids entertained throughout the flight, fear of criticism from airline staff, concerns about the facilities available and also the fear that their children will be scared of flying. 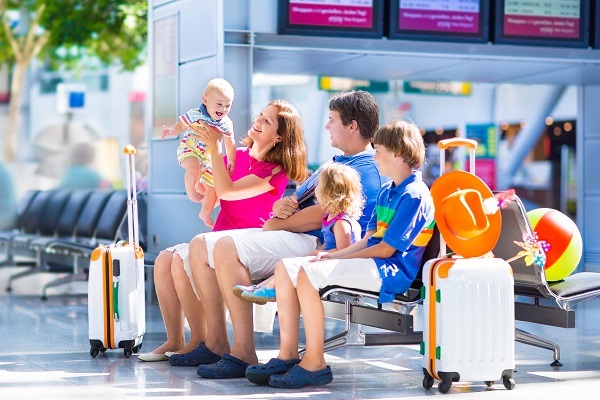 Interestingly, the research also found that a whopping 78% of parents would support the proposed plans for ‘family only’ sections on planes, to keep them apart from childless passengers. • Be prepared – right from the beginning accept that the flight might be a little bit stressful – you’ll instantly feel better once you come to terms with this. Ensure you have packed plenty of snacks, games and gadgets to keep your child entertained. Remember that children can have very short attention spans, so split the flight into sections and plan a new film, game or activity for each part. • Stay calm – if your child does start to cry or have a tantrum it is very important that you stay calm, otherwise your nervous energy may make things worse. Try to walk up and down the aisle with the child to soothe or distract them, and ensure you repeat instructions to older children, so that know what behaviour is expected of them. • Don’t be afraid or embarrassed to apologise multiple times – everyone on that plane has encountered a child at one point in their lives, and everyone knows that children cry and get bored, so don’t beat yourself up. Keep apologising and you’ll keep everyone (nice) on side. • Talk to the cabin crew – the cabin crew probably have years of experience in dealing with unhappy children on flights. Tell them you are nervous and they will help as much as possible and offer advice. They are there to ensure that everyone on that plane is happy, so it’s in their best interest to help you maintain calm.